BUENOS AIRES, Argentina, march 30, 2011 (KATAKAMI.COM / AP) — Hugo Chavez, winner of a journalism award? The Venezuelan leader regularly clashes with critical media, but Argentina’s University of La Plata was giving him its Rodolfo Walsh Prize on Tuesday “for his unquestionable and authentic commitment” to giving people without a voice access to the airwaves and newspapers, AP reported. Chavez has bankrolled the growth of the Telesur network, providing a state-funded alternative to privately financed broadcast stations across Latin America. He has a sure ally in Argentine President Cristina Fernandez, who sees privately owned media groups as a bigger threat to freedom of expression than state control of airwaves or newsprint. Fernandez is trying to transform Argentina’s communications industry through a law that would break up media monopolies and force cable TV providers to include channels run by unions, Indians and other activists. The two presidents also signed commercial accords dealing with food, transport and energy, and they visited a state-run factory where Argentina will build ships for Venezuela’s oil industry. Venezuela will import thousands of Argentine cars and 600,000 tons of food and agricultural equipment, representing a $400 million investment, Chavez’s office said. Argentine companies also will transfer their technology and help build about 20 factories in Venezuela to manufacture small motors and refrigerators. In exchange, Venezuela will keep supplying Argentina with oil. 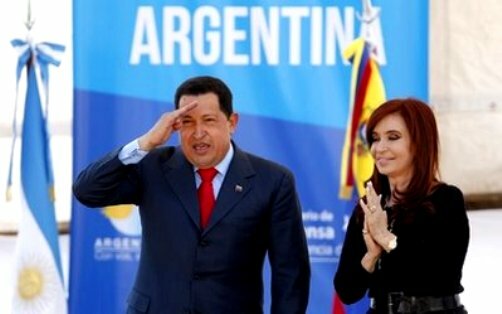 Chavez began his tour of Argentina, Uruguay, Bolivia and Colombia only days after U.S. President Barack Obama skipped these countries in his first visit to South America, a goodwill tour overshadowed by the U.S. attacks Obama ordered on Moammar Gadhafi’s forces in Libya. Both Chavez and Fernandez strongly criticized the air attacks Tuesday. 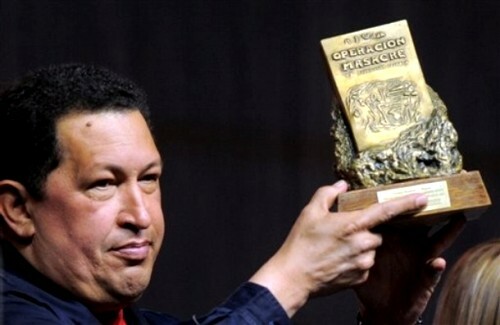 Chavez is a declared ally of Gadhafi, who honored the Venezuelan leader in 2004 with his Al-Gadhafi International Prize for Human Rights, an honor he shares with Fidel Castro (1998), Evo Morales (2006) and Daniel Ortega (2009). The majority owner of Globovision, Venezuela’s only remaining critical TV channel, fled the country rather than be jailed pending a conspiracy trial for keeping two-dozen new vehicles at one of his homes. Guillermo Zuloaga, who also owns several car dealerships, said Chavez ordered bogus charges. Walsh was an investigative journalist who co-founded Cuba’s Prensa Latina press agency and later joined Argentina’s leftist Montoneros guerrilla group. He died in a military ambush in 1977. “It would take a long time to enumerate the long chain of actions Chavez has taken against the right of the Venezuelan people to receive information,” he said. CARACAS, Venezuela, March 5, 2011 (KATAKAMI.COM) – Moammar Gadhafi’s government has authorized Venezuela to select countries for an effort to mediate an end to Libya’s crisis and to coordinate the effort, Venezuela’s foreign minister said Friday. Venezuelan President Hugo Chavez, who calls Gadhafi a friend and ally, has proposed creating a group of “friendly countries” to help mediate in the conflict. Gadhafi’s opponents in Libya, however, have shown no willingness to negotiate as long as he remains in power. Countries including the U.S. and Italy also have been cool to Chavez’s proposal. The idea won support Friday from the foreign ministers of Cuba, Ecuador and Bolivia as well as from other officials representing Nicaragua, Dominica and St. Vincent and the Grenadines. They joined Maduro in Caracas for a meeting of nations belonging to the Venezuela-led Bolivarian Alternative bloc, or ALBA. 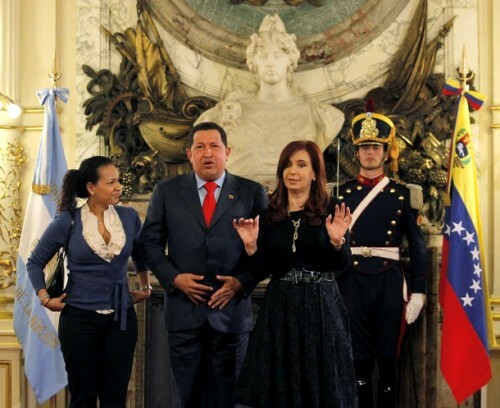 Chavez read a statement Friday night in which the group condemned attempts at “intervention” in Libya by other countries and called for a cease-fire. “We must make a very great effort. We cannot lose a day,” he said. 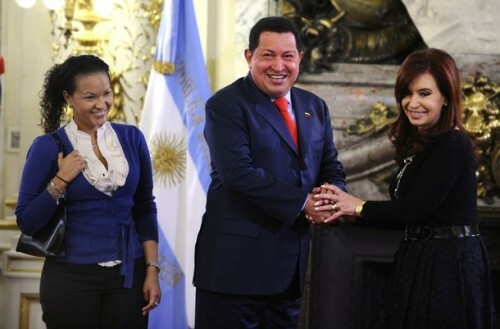 Chavez accused news media of presenting a distorted view of events in Libya. He did not discuss the Libyan government’s crackdown on civilian protesters, which has drawn condemnation from other nations. 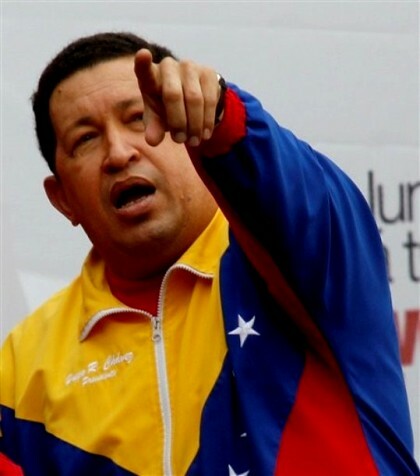 CARACAS, March 1, 2011 (KATAKAMI.COM) – Venezuela’s President Hugo Chavez proposed on Monday an international mediation effort to seek a peaceful solution to the uprising against his friend and political ally Muammar Gaddafi of Libya. As reported by Iranian Press TV, the firebrand South American socialist leader said he had already discussed the idea with some members of the ALBA bloc of left-wing Latin American nations and some other countries in Europe and South America. The United States and other foreign governments discussed military options on Monday as the Libyan leader scoffed at the threat from a spreading popular uprising and forces loyal to him massed in the country’s west. Along with leftist Latin American governments in Cuba and Nicaragua, Venezuela has alleged that Western powers want to occupy the North African nation for its oil wealth. 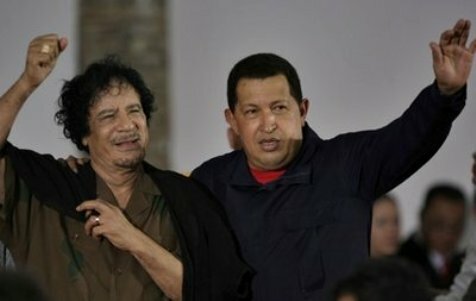 Chavez, who is the main critic of US power in the region, has showered Gaddafi with gifts and praise as a fellow revolutionary on six visits to Libya since he won office in the South American OPEC member in 1998. Gaddafi came to Venezuela in 2009, giving Chavez a Bedouin tent and receiving a replica copy of the sword of South American independence hero Simon Bolivar. The Venezuelan said it would be hypocritical of him to join the chorus of international condemnation of Gaddafi now. 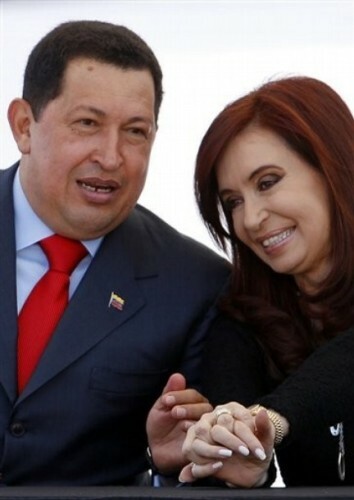 “As everyone says today that Gaddafi is a murderer, then Chavez has to say so too? I’m not convinced,” he said. 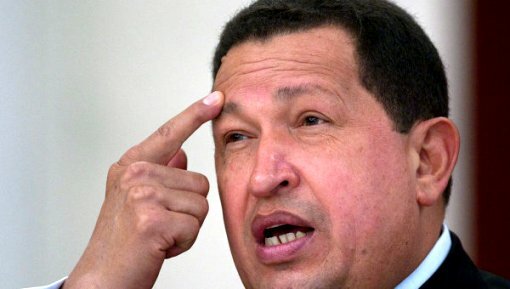 Chavez opponents say his links with Gaddafi, and refusal to condemn his violence against opponents, demonstrate the similarly autocratic nature of the Venezuelan leader. December 19, 2010 (KATAKAMI / VOA) — Venezuela’s president has vowed to reject the U.S. nominee for ambassador to the South American country. Hugo Chavez said Saturday in a televised speech Larry Palmer will not be allowed to take up his post because the diplomat has been critical of Caracas. Palmer upset the Chavez administration when he told a U.S. senator that morale was low in the Venezuelan military. Palmer also expressed concern about Colombian rebels finding refuge in Venezuela. 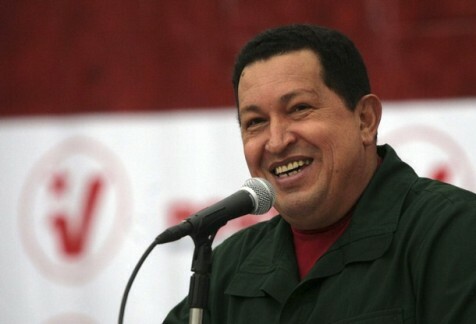 President Chavez says he has told Foreign Minister Nicolas Maduro to detain Palmer if he tries to enter Venezuela. The U.S. Senate is expected to confirm Palmer’s appointment soon. November 28, 2010. (KATAKAMI / RIA NOVOSTI) — Moscow has recently loaned Venezuela $4 billion to buy Russian military hardware, Venezuelan President Hugo Chavez said. Speaking at a ceremony to celebrate 90 years of Venezuela’s Air Force on Saturday, Chavez said the sides reached the loan agreement during his visit to Russia in October although no official statement was made at the time of the visit. “We were in Russia not long ago and the Russian government gave us a $4-billion credit to help us with [building up] our defense capability,” the president said. Moscow has already provided Caracas with several loans to buy Russian-made weaponry, including a recent $2.2-mln loan on the purchase of 92 T-72M1M tanks, the Smerch multiple-launch rocket systems and other military equipment. Russia has also exported 24 Su-30MK2 Flanker aircraft, over 40 Mi-17 Hip transport helicopters and 10 Mi-35 Hind-E gunships as well as three Mi-26T Halo heavy transport helicopters to Venezuela. Chavez did not specify the types of weaponry Venezuela was going to buy from Russia in the future. He justified big spending on arms by his country’s need to defend the nation from potential external threats.